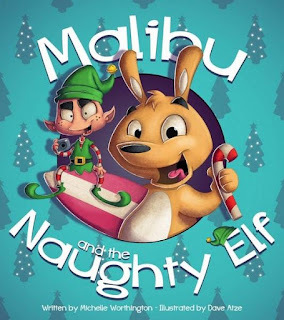 Malibu and the Naughty Elf is the Christmas-themed follow-on from The Three-Legged Kangaroo from Uluru. In this new instalment, Santa and Mrs Clause have donned their cozzies and come to spend Christmas in Australia with their friend Malibu the kangaroo. The elves and the reindeer are enjoying the fun and sun on Bondi Beach, but one elf isn’t happy. There is nothing that Bobby the elf likes about Christmas and while the other elves are enjoying themselves, he is grouchy, miserable…and naughty. Soon Santa is tearing his hair out and it is up to Malibu to figure out why Bobby is spoiling Christmas for everyone. Full of surfing Santas, skateboarding reindeer and elves playing in the sand, Malibu and the Naughty Elf sets itself up as a classic Christmas down-under tale and, certainly, there’s plenty to satisfy on that front. The story itself, however, is less about Christmas and more about the struggles of an elf trying to fit in and the unhappiness that comes from pretending to be something you’re not. The illustrations by Dave Atze are bold, colourful and packed with humour, surely a winning combination for any pre-schooler. With Christmas just around the corner, Malibu and the Naughty Elf is one to consider for the stocking.